Encourage kids to share God’s love with others through service and simple acts of kindness. Offer a safe place for children and families of all kinds to come and enjoy community, fellowship, and God’s love. It is an exciting adventure for kids in preschool through fifth grade based on the rotation model for Sunday School. It starts at 10:45 on Sunday mornings. Each week begins with a large group time before separating into age-based groups for workshops. Bible themes and stories are introduced and explored over a five week period. Kids are encouraged to touch, taste, feel, hear, and experience the story through different media and materials. Our classrooms are very inviting and kid-friendly. Props, toys, and decorations create a unique feel in each room. Children are enriched each weekend in Sunday School with strategic and fun programming! Here the lessons come alive through books, drama, and storytelling. We use activities and games that encourage kids to relate the Bible lessons to their everyday lives. Here, lessons are turned into yummy treats, which we prepare and cook within our own café. We sing, play, and dance the lessons into life using our voices, musical instruments, or recorded music. Our own movie theater, complete with a popcorn machine! Here, we get to see the story take place on the big screen. 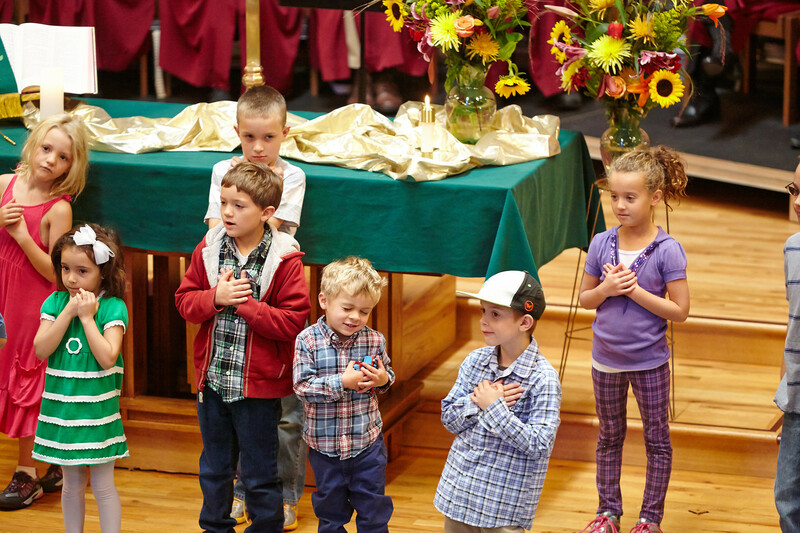 At Mountain View, kids are invited to worship alongside the congregation in our prayground. The prayground consists of child size tables and chairs, dancing ribbons, small toys, and activities to encourage worship experiences through play and crafts. Located at the front of the sanctuary, the prayground announces to kids, parents, and all who come to our church that our kids matter, that they are a part of our church, and that we find value in having them in worship. Having kids in worship offers an opportunity for spiritual formation in a way that Sunday School cannot. Kids will see their parents, family members, and other adults worshipping together, helping them gain a better sense of community and belonging. In addition, worship is a habit. If we want our kids to grow into adults that value worship, we must create ways to help them value worship as a child. The prayground is a part of our worship space and will be available every Sunday for kids who choose to worship there. During the school year, kids are encouraged to attend Sunday School during worship time, however, there will be no Sunday School on the first Sunday of each month. Instead, kids will be invited to worship in the prayground for the entirety of the service, allowing kids to participate in Communion, as well as experience all other parts of the worship service each month. Our caring nursery staff are available to take care of your children ages 0-3 during both the 9:03 & 10:30 am worship services in our clean, vibrant, and fun nursery room. Our nursery staff is available to cover child care needs for meetings, rehearsals, special worship services, and other church events. Please contact Susie Adams, nursery coordinator, at susan.adams888@gmail.com to request child care. Please allow at least 2 weeks when making child care requests. Drop the kids off for a night of movies, pizza, crafts, and play while you enjoy some quiet time! Cost for the event is $5 per child/$10 per family, and is open to kids of all ages. (Nursery care available for our younger participants.) You do not need to be a member of the church or attend Mountain View Preschool to take advantage of this program, so feel free to join us! Each summer, kids ages 3years-5th grade are invited to spend a week at Mountain View for Vacation Bible School. Here, they will spend the week learning, singing, creating, playing, experimenting, and so much more as we explore God’s never ending love for us all! VBS runs 9-12:30 each day and costs $25 per child/$40 per family. Dates and themes for VBS 2018 will be announced in the spring!